A calavera (Spanish for "skull") is a representation of human skull made from either sugar or clay, which is used in the Mexican celebration of the Day of the Dead and the Roman Catholic holiday All Souls Day. 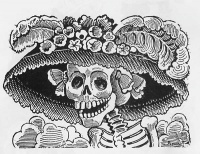 Calavera can also refer to any artistic representations of skulls, such as the lithographs of José Guadalupe Posada. Unless indicated otherwise, the text in this article is either based on Wikipedia article "Calavera" or another language Wikipedia page thereof used under the terms of the GNU Free Documentation License; or on original research by Jahsonic and friends. See Art and Popular Culture's copyright notice. This page was last modified 11:04, 27 September 2014.